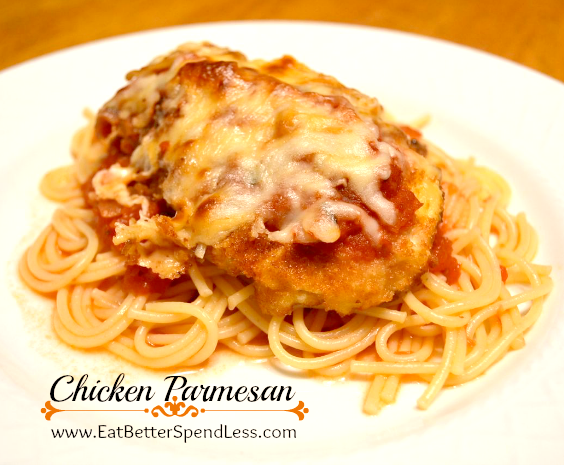 Chicken Parmesan has always been one of my favorite meals. Sometimes I order it at restaurants but it’s so easy to make at home (and get very similar if not better results). It looks like a lot of steps but it’s really pretty simple. And the house smells so good all day! First, chop up your onions and garlic. They’ll both soften up and sort of disappear into the sauce. Let those cook in a skillet with a little bit of olive oil, just for a few minutes. Add your olives, bay leaf and basil and cook for another 5 minutes. 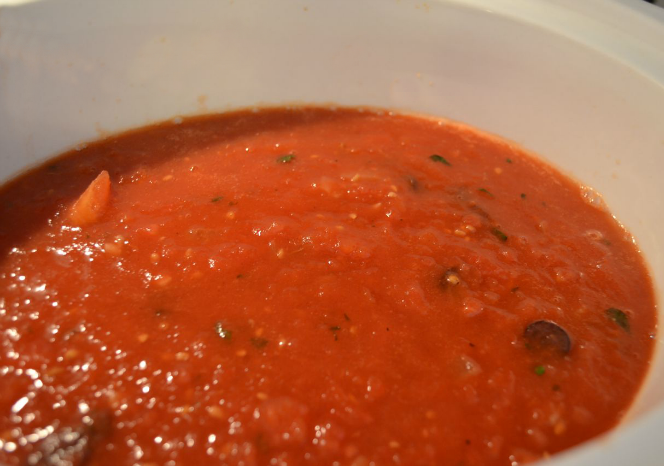 If you want your sauce to be really smooth, chop your tomatoes in the food processor first. Add tomatoes to the skillet. Add a pinch of salt, a tsp of sugar, and some fresh ground black pepper (about 7or 8 turns). Transfer to the Crock Pot and let it hang out on low all day or on high for a few hours. To make the chicken, you’ll need to make a little assembly line. 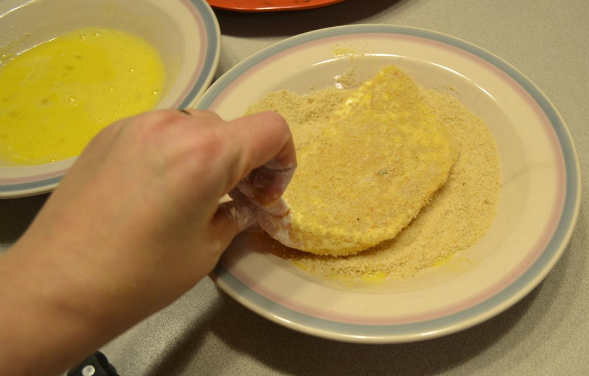 First your flour mixture (flour, salt, pepper) then your egg and water whisked together, then your breadcrumbs. I found a sale on thin cut chicken breasts so I went ahead and did that. If yours aren’t thin cut, just cut each one horizontally and you’re good to go. 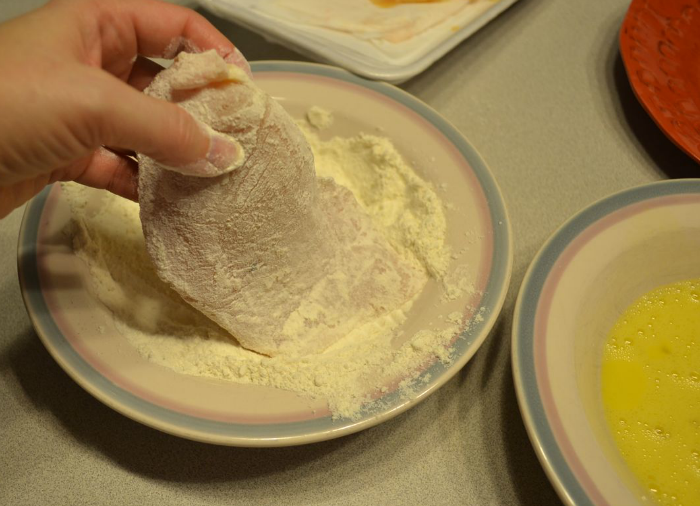 First, dredge the chicken in the flour on both sides. Keep one hand clean for scooping more flour onto the chicken and for answering the phone. You know the phone is going to ring! Then a quick swim in the egg bath! And now the crunch. Press that baby into those wonderful bread crumbs. You may have to use the clean hand to scoop up some crumbs and press them lightly into the chicken. Which means you’ll have to hold the phone with your shoulder. Get someone to massage it later, you deserve it. Stick each piece on a clean plate as you finish them. You’ll want to have them all ready at once before you start to brown them. I use a mixture of olive and canola oils. The canola keeps the olive from burning. The olive makes me feel like I’m doing the right thing. 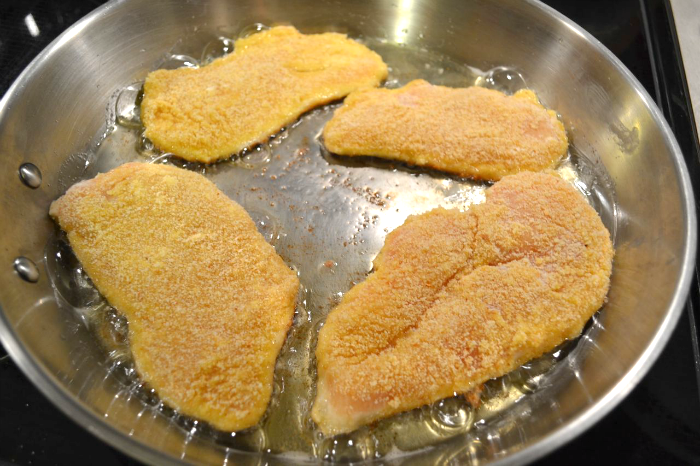 Heat your oil and add your breaded chicken to the pan. Cook chicken on each side, about 2-4 minutes. You want it to be almost cooked through but it will continue to cook in the oven. Transfer chicken to a casserole dish and top with sauce. And some mozzarella. Bake on 375° for about 15 minutes. Meanwhile, cook your spaghetti in salted water. Drain it but don’t rinse. 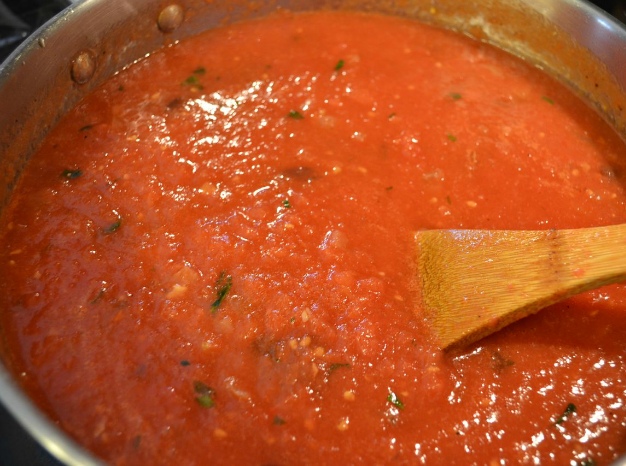 Put spaghetti back into the pot you cooked it in and add some sauce to keep it from sticking. 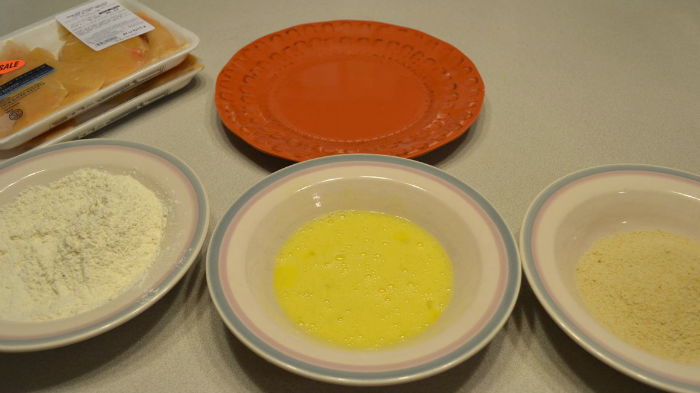 To plate the meal, start with a portion of spaghetti, followed by sauce, then a piece of chicken. They’ll think you hired a personal chef! Heat some olive oil in a skillet. 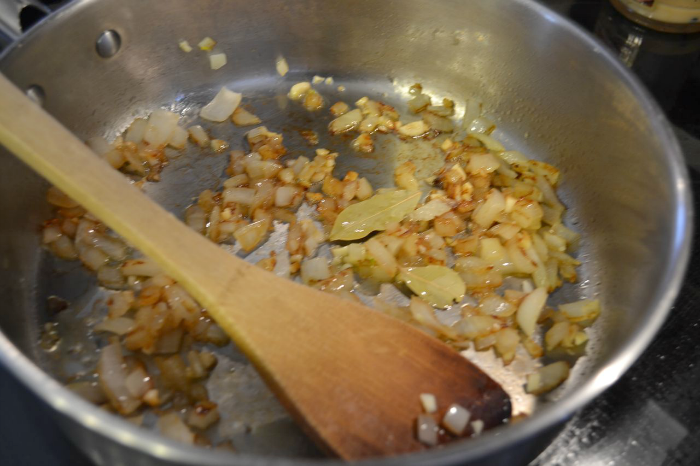 Mince the garlic and onion cook until softened. 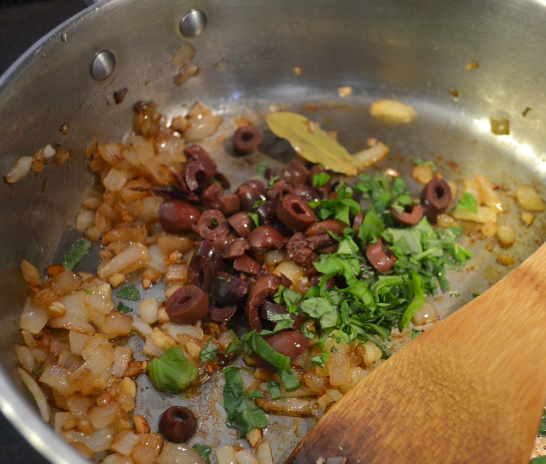 Add bay leaf and olives and cook another 5 minutes. Pour it all into a crock pot and cook on low for 5-8 hours. 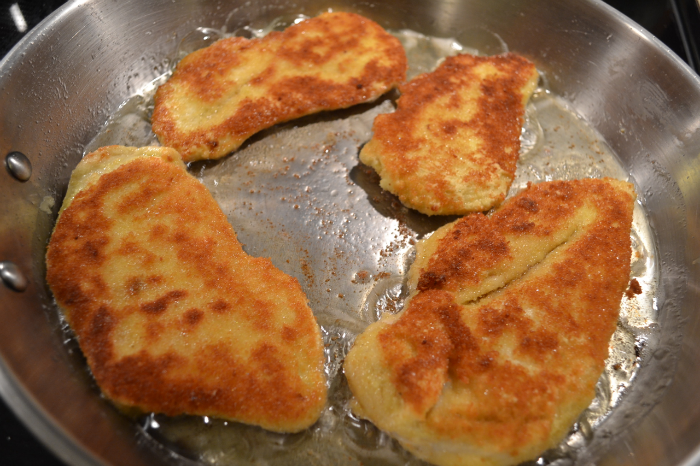 In a large skillet, combine a TBSP each of olive oil and canola oil, heat on medium while you prepare the chicken. Cut each breast in half horizontally, so you have two thin pieces from each. The first bowl will have a mixture of the flour plus some salt and pepper (be generous with the salt, you won't use it all). The second will be your egg and water whisked together until it's foamy. The third will be your bread crumbs. 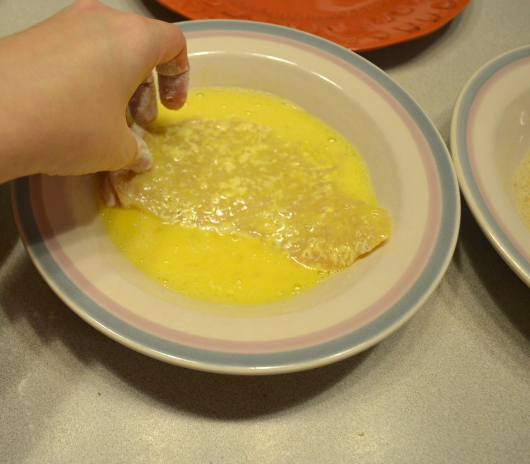 Using one hand to handle the chicken, dredge it first in the flour, (both sides), then the egg, allowing the excess to drip, then the bread crumbs. 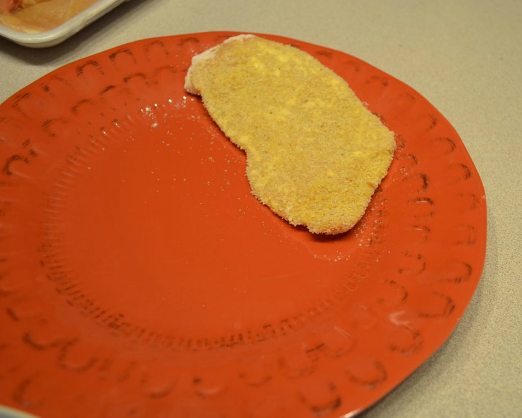 Lay the breaded piece on a clean plat and continue until all of your chicken is breaded. Put the chicken in the hot oil and brown on each side, about 2 minutes. You want your chicken to be almost cooked through but it will continue to cook in the oven. Transfer from the skillet to a prepared casserole dish. 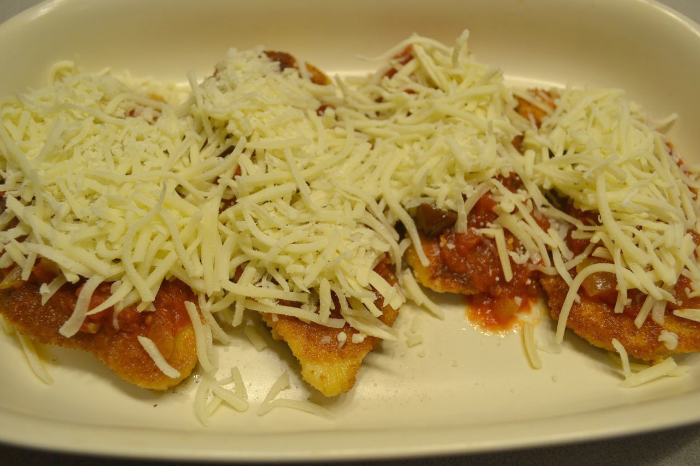 Ladle sauce over each piece, followed by parmesan cheese, then mozzarella. Bake on 350 for about 15 minutes or until the cheese is melted and golden. While baking, cook your spaghetti in generously salted water and drain but don't rinse. Add some sauce to the spaghetti to keep it from sticking. Put a serving of spaghetti on a place, topped with more sauce. Add a piece of chicken on top of the spaghetti. This looks so delicious, I can’t wait to try it. I’ve pinned it for later. I hope you enjoy it, thanks for stopping by! (And for pinning). I definitely will try this! Thank you for such detailed steps and pictures. Thank you so much for bringing your delicious chicken to Family Fun Friday! I am pinning it for later! Blessings! Your Chicken Parmesan looks delicious and we will just love it! Thanks so much for sharing with Full Plate Thursday and have a great weekend! 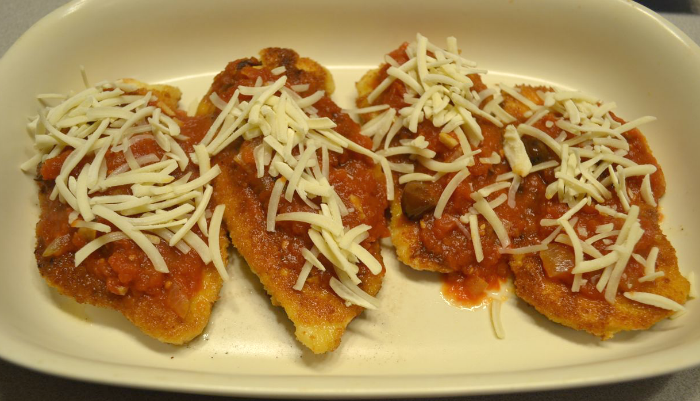 I was so excited that I finally made a chicken parmesan (without using frozen, breaded chicken and store-bought sauce) that we all liked. Mine was a little heavy on the olives but I decreased the amount for the recipe. I hope you enjoy it! Hi Beth! Your delicious chicken is one of our features at Family Fun Friday this week! Hope you can stop by again this week! Blessings to you! Oh how fun! Thanks so much. I do plan on coming back this week! 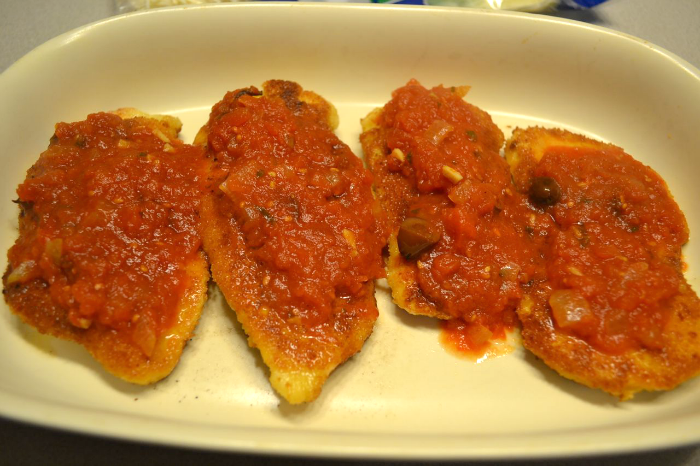 How can I make the chicken Parmesan gluten free without using bread crumbs – what can I substitute? I’m not very experienced with gluten free substitutions, but I would think you could just buy a gluten free bread (or even crackers) and put a few pieces in the food processor to make your own crumbs. I wouldn’t be at all surprised to find out they make gluten free bread crumbs. 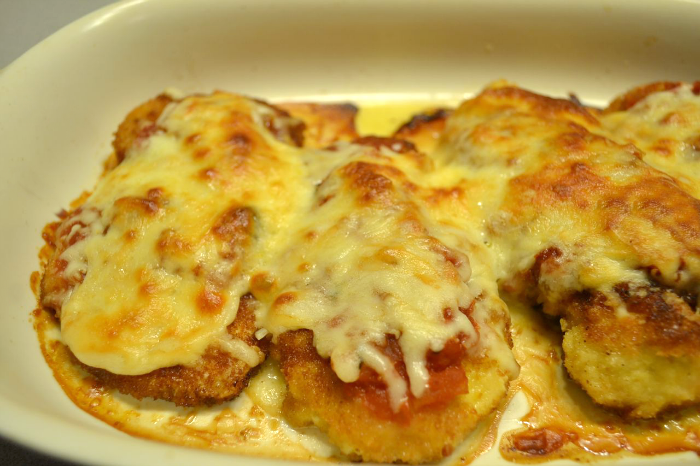 Other than those two options you could always just skip the breading altogether and just cook the chicken and then top it with the sauce and cheese.